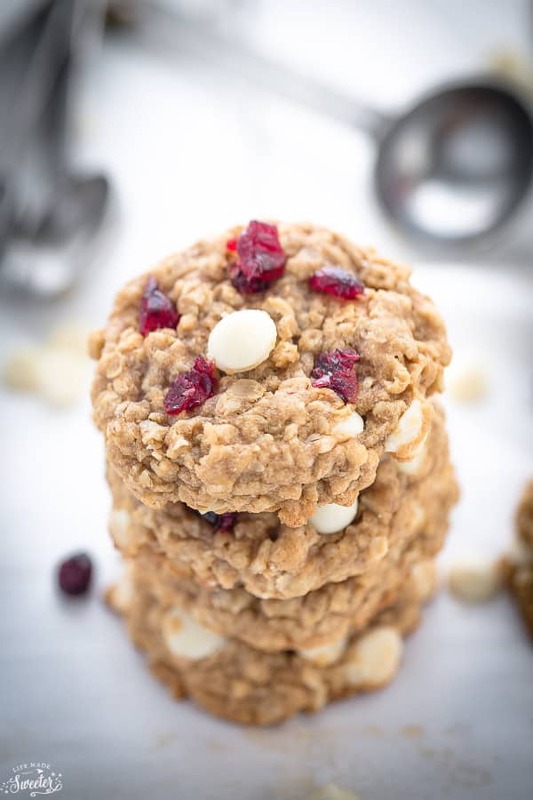 White Chocolate Cranberry Oatmeal Cookies are the perfect sweet treats for the holidays. 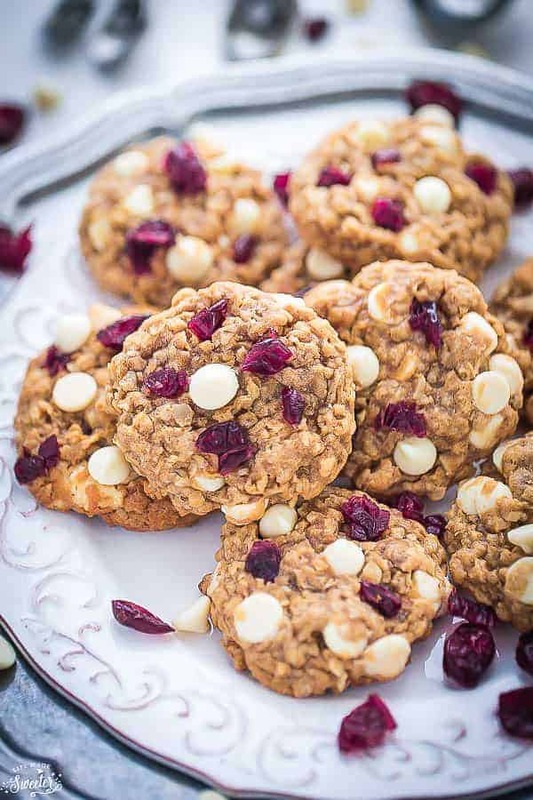 Soft, chewy and best of all, so easy to make with oats, white chocolate chips and dried cranberries. What are your favorite cookies to make? It’s National Cookie Day so I thought it would be the perfect chance to update one of our all time favorite cookies. Oatmeal cookies of any kind will always hold the most special place in my heart. 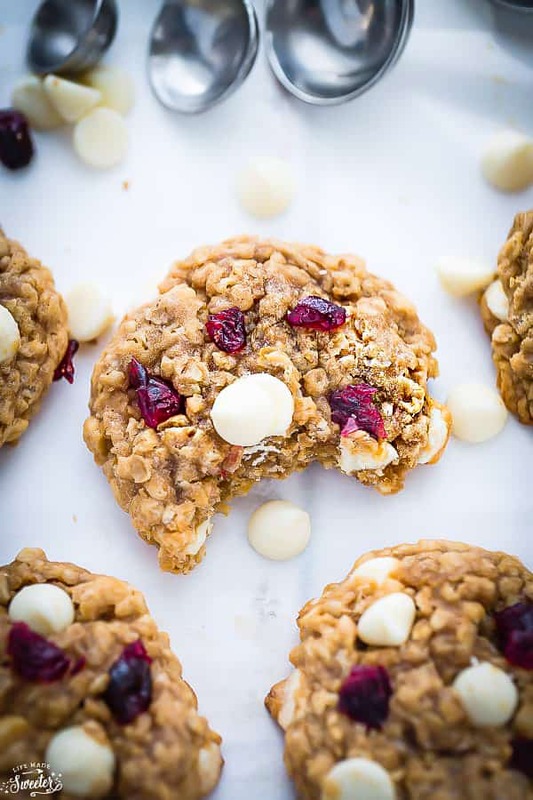 And these White Chocolate Cranberry Oatmeal Cookies are a must once cookie season hits. They’re soft, chewy and so easy to make. The best part about making your own homemade cookies at home? You can switch up the add-ins depending on what you feel like or having on hand. Not a fan of white chocolate – leave them out or swap them out for semi-sweet or dark chocolate. 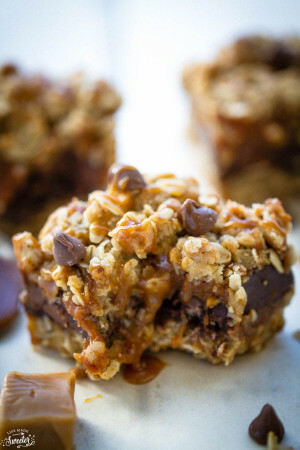 I took my favorite oatmeal cookie base and swapped out the peanut butter for cookie butter. If you can’t find cookie butter or are not a fan, you can swap in peanut butter or almond butter mixed with 1 teaspoon ground cinnamon. This recipe calls for melted butter and 2 large room temperature eggs. Be sure your butter is cooled before mixing in the eggs. 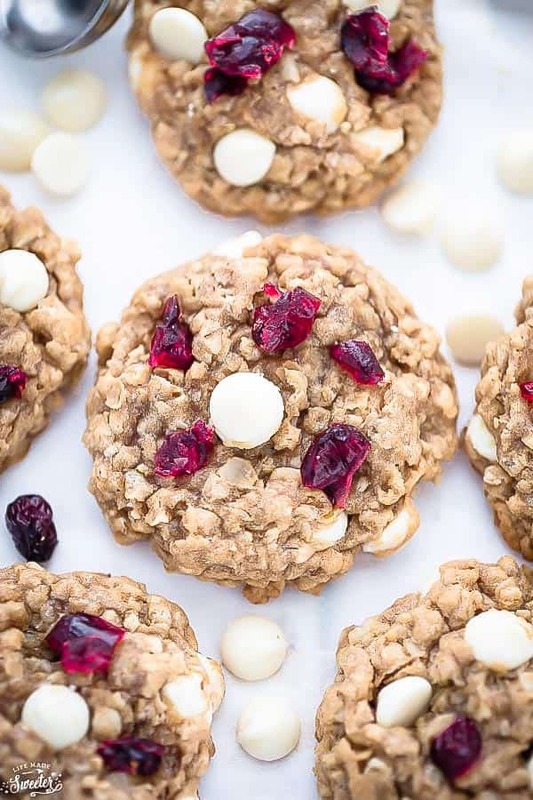 These White Chocolate Cranberry Oatmeal Cookies make a delicious snack and are so festive with the white chocolate chips along and dried cranberries. 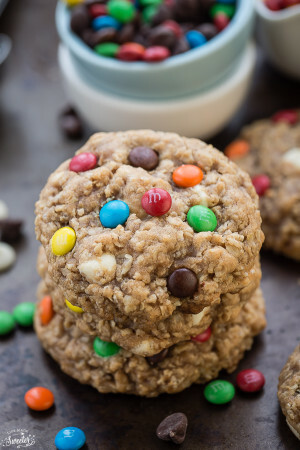 They bake up soft and chewy with light crispy edges – just the way my ideal oatmeal cookie should be. 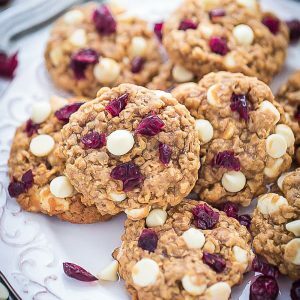 I usually make these White Chocolate Cranberry Oatmeal Cookies every year around Christmas and they are always a favorite! Serve these with a nice tall glass of milk or a cup of hot cocoa to enjoy by the fire around the holidays. In a large bowl, whisk together the flour, baking soda, baking powder, and salt. Stir in the oats. In a separate medium bowl, whisk the melted butter and brown sugar together until smooth & combined. Whisk in the vanilla, cookie butter, then finally the eggs until well incorporated. Pour the wet ingredients into the dry ingredients and gently mix together with a wooden spoon or spatula until just combined. Fold in the white chocolate chips and dried cranberries reserving 1/4 cup of each for pressing on top, if desired. Once the dough has chilled, preheat oven to 350 degrees Fahrenheit. Line two cookie sheets with parchment paper or silicone baking mats. Using a large cookie scoop or measure and roll 2 1/2 tablespoon size cookie dough balls. Place about 8 balls onto prepared cookie sheet. Bake in preheated oven for 10-12 minutes for a soft and underbaked cookie. they will continue to bake on the cookie sheet. Press a piece or two of the remaining white chocolate chips and cranberries into each cookie if desired. Cool on the cookie sheet for 10 minutes before transferring to a wire rack. These look so chewy & festive, Kelly! 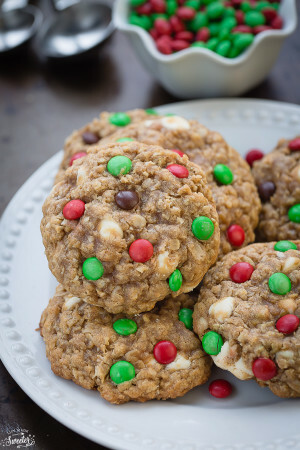 These cookies are perfect for the holidays! I love the festive cranberries:) Have a great weekend! These look super yummy! I’ll take a dozen! In my opinion, cranberry and white chocolate is about as classic and delicious and meant to be as peanut butter and chocolate. It’s such a great combo! These cookies look awesome.